Ciao e benvenuto al nostro (doloroso) blog multilingue su HOST. Ecco alcune frasi Italiane utili. So, every two years Marco rocks up at HOST (the biggest catering show in Europe) and shows off it’s wares. Our full range of coffee brewers, water boilers and gadgetry will all be on display. And… Drum roll please. We’ve only gone and gotten ourselves a JET6 Twin for the event! 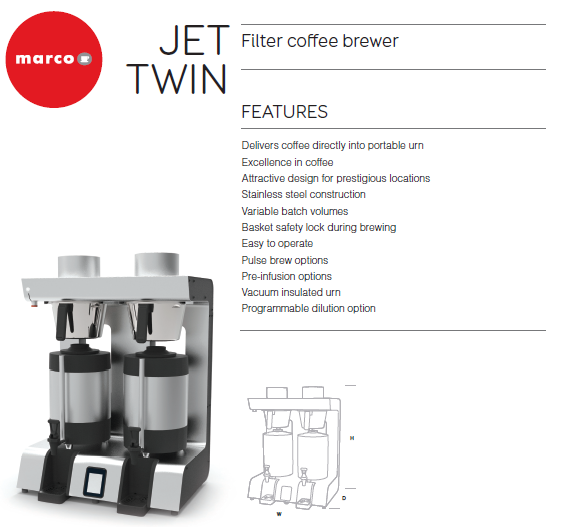 It comes with all the functionality of our usual JET plus one or two additional special features for the Twin. If you can’t make it to HOST the product page will be live on our website from November 1st for more details or you can talk to your regional sales office. The good people at the Fiera did send out a presser to include in our blog so here goes. For 38 editions, Host has been the absolute leader in the Ho.Re.Ca., food service, retail, large-scale distribution and hotel industries, establishing itself as a quality international business marketplace. An exclusive meeting place for leading manufacturers in the market and top spending buyers from all over the world. A unique and cross-cutting eventwhere many related industries speak the language of business in an evolved, authoritative way. It is the heart of a permanent network of contacts that, for 5 days, come together in perfect balance. 2015 will once again prove the future begins with Host. Milan is already the undisputed fashion and design capital of the world, but from 23 to 27 October 2015 it will also be the global hub for the professional hospitality industry. Visitors will be impressed by the seamless and synergistic layout of the twelve halls, where manufacturing and shared services sit side by side yet each and every sector and individual exhibitor enjoys the limelight, maximising every investment. Visitors will also appreciate being able to find their way effortlessly across the trade show floor, thanks to a venue that has been designed thoughtfully to enable them to optimise time and enhance the visitor experience. The entire event aims to far exceed both exhibitor and trade visitor expectations. But Host 2015’s visibility will be further enhanced by the timing of the event – which will overlap with the Universal Exposition running from 1 May to 31 October and only a very short distance away. More than 20 million visitors will be flocking to Milan from every corner of the world to attend an event that will focus the attention of governments, institutions and consumers on Expo 2015’s theme: “Feeding the planet, energy for life”. People will be talking about food, health, wellbeing, innovation and technology with a view to securing a more sustainable future for our planet. Topics that are also extremely relevant to Host, creating remarkable, once-in-a-lifetime synergy between the two events. The upshot of all of this? If you’re interested in seeing the best coffee brewers and water boilers on the market today get yourself along to Pavilion 13, stand E36 and have a chat with us. Our representatives from around the world will be on site to answer your questions. There may be rugby (if we can get the stream to the TV). There’ll be amazing coffee from Tim Wendelboe, 5senses and Koppi. There’ll be Anne Lunnel from Koppi!